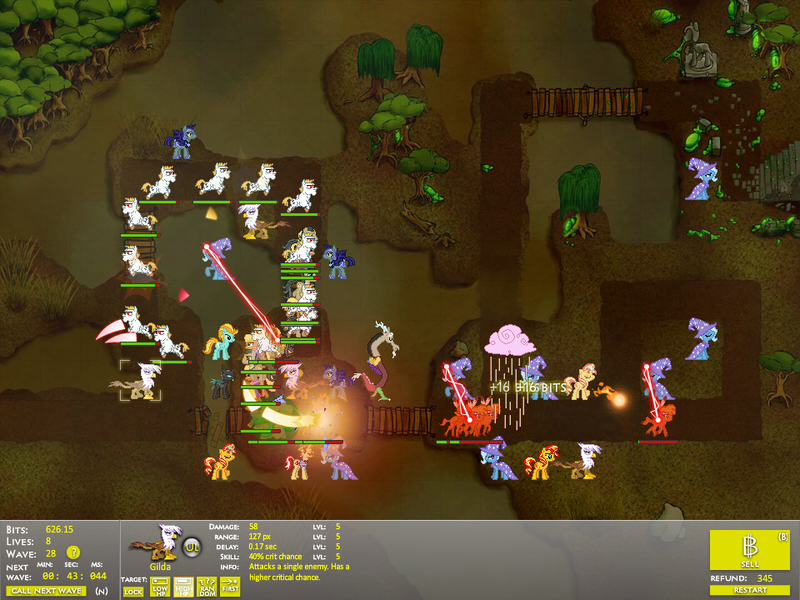 Hot off the queue of things that have lingered in our inbox for a depressingly long time, Canterlot Siege 3: Inversion is the latest entry in the line of Flash-powered tower defense games by futzi01 starring characters from the MLP universe. The main difference in this one is that now you're playing as the villains, trying to stop the good guys from reclaiming their home. Gameplay-wise, notable additions include the ability to place boss characters - fully upgraded attackers with special attack patterns - and additional variety in the level choices, going from the old design philosophy of different paths in a grassy field to levels with some actual variety in them, even if only visually. The game does get difficult fast - as someone not well-versed in tower defense games, I struggled to make it very far my first few rounds - but it becomes more manageable with practice. At this point I mostly post these things to keep a log of them. Most of the people interested in this game probably follow the author and played it months ago.